Valluvar Kottam is a popular monument in Chennai, India which is dedicated to the classical Tamil poet, philosopher and saint Thiruvalluvar. Valluvar Kottam is located at the intersection of the Kodambakkam High road and the Village road, was constructed by M. Karunanidhi - the then Chief Minister of Tamil Nadu during 1975-1976s.Valluvar Kottam now stands at the point which was the deepest point of a lake which was located in the area. The monument was constructed in 1976 in the memory of Thiruvalluvar, who wrote his famous Thirukkural about 2,000 years ago. All the 133 chapters of the Thirukkural which include 1330 verses are inscribed on bas-relief in the front hall corridors. The construction of Valluvar Kottam is like a temple chariot, and it is a replica of the temple chariot in Thiruvarur. A life-size statue of the Thiruvalluvar has been installed in the 39-m-high chariot. 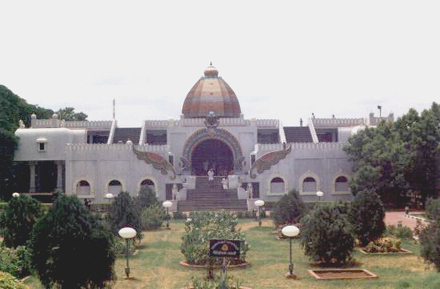 The auditorium of Valluvar Kottam can accommodate around 4,000 people. The architect of the memorial is South Indian traditional architect V. Ganapati Sthapati, who is also the architect of the Thiruvalluvar Statue at Kanyakumari.